And, as it should be no surprise – a new Fractal. Again from ClikNStitch as a download. The fabric is 14 count Aida in Pacific Blue. Which I picked for no reason other than it is bright. The finished size will be the same as the previous fractal. Started 1 Feb with me even getting the sewing machine out to finish off the edges. 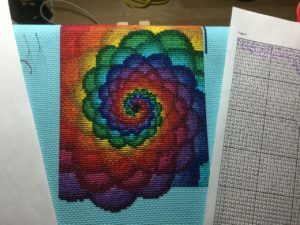 What became quickly obvious with this pattern is that there are reasonably good size areas of solid color so that the stitching is proceeding much faster than either of the two previous cross-stitches.